This page was last modified on 22 April 2008. Description: Philip Chave of Antique Collector, an online bookstore of "antique and specialist books by UK and world authors," awards web sites to recognize webmasters for "the effort and time," "flair for design," "eye for detail," and "knowledge" used "to create and maintain [their] site." Sites are evaluated on content, load time, ease of navigation, graphic quality, page layout and design. Citation: "Congratulations on a really great website! 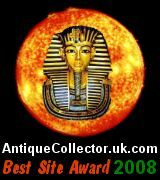 I am more than pleased to offer you the Antique Collector Best Site Award. I love the way you seem to celebrate your youth in the States. I do wish more English schools would do something like this. ... My very best regards and your continued online success, Phil"
Description: Sherry and Chuck Hartley, horse breeders specializing in Missouri Fox Trotting and Spotted Saddle horses, of Pleasure Gait Farms in Kennett, Missouri offers their award to web sites which are family friendly. Sites are evaluated primarily on family friendly content. Citation: "Your web site is a winner! We really enjoyed visiting your wonderful site and would be honored if you would accept our award." Description: "Pointless Communications Corp. is a company that arbitrarily rates sites on the World Wide Web according to our own tastes. Fortunately we have undiscriminating tastes, since our corporate mission is to see that every site on the World Wide Web, no matter how poorly constructed and how devoid of worthwhile content, is recognized, and to encourage all authors, regardless of talent, to keep on writing and filling up the bandwidth." Sites "automatically qualify" if they "haven't been selected by that other outfit as being worthy of their designating your site among the top five percent of all web sites." Citation: "This site has been rated among the bottom 95% of all Web sites by Pointless Communications ®." Description: Art Space 2000, an online art gallery, rewards "creativity, integrity and excellence on the web" with this award. Sites are evaluated on originality, design, appearance, navigation, and purpose. Citation: "Congratulations from all the staff at Art Space 2000.com. You have won the "World Web Award of Excellence" for originality, overall design and appearance, ease of navigation, and content. Keep up the good work. ... You have obviously worked very hard. Investing your time, and skills into making a great web site." "Each day we receive hundreds of submissions for our web award. Approximately three out of every ten sites win our web award, so you are in a very small group of outstanding web designers. It is always refreshing to visit a site as well done as yours." Description: Omniana Graphic Design, located in Oak Creek, Wisconsin, offers awards "to outstanding Web Pages in recognition for the hard work that was put into the development and creation of these web sites." 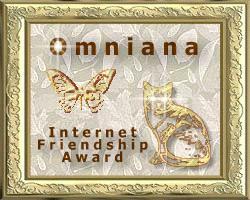 Citation: "This Friendship award is free to all who have a Family-Friendly Site. We feel everyone should be able to have an award on their site." Description: The Not Boring Site Award is for webmasters who "have a web page and have spent/spend a good amount of time and effort working on it." Citation: "The webmaster of [this site] has worked very hard on his/her page and that is the reason he/she has recieved ... [the] Not Boring Site Award. We at notboring.com applaud the excellent work that the webmasters out there are doing and recognize the time and effort that is put into their pages, and have awarded them with the prestigious ... Not Boring Site Award." Description: The It's Wishcraft Award is presented by Hannah, a Dutch webmistress, "to others to possibly encourage them or just show [her] appreciation for their hard work." Sites are evaluated on content, design, navigation, and first impression. Citation: "I am happy to announce that you've won my Bronze Award. My award is 40% contents and 30% design and in those areas you scored less points. I missed 'to the top' links/buttons, but rest of navigation is very easy, the site loads fast and it is very obvious you put a lot of time in your site. So: you scored 72 points out of a 100 and that means Bronze."